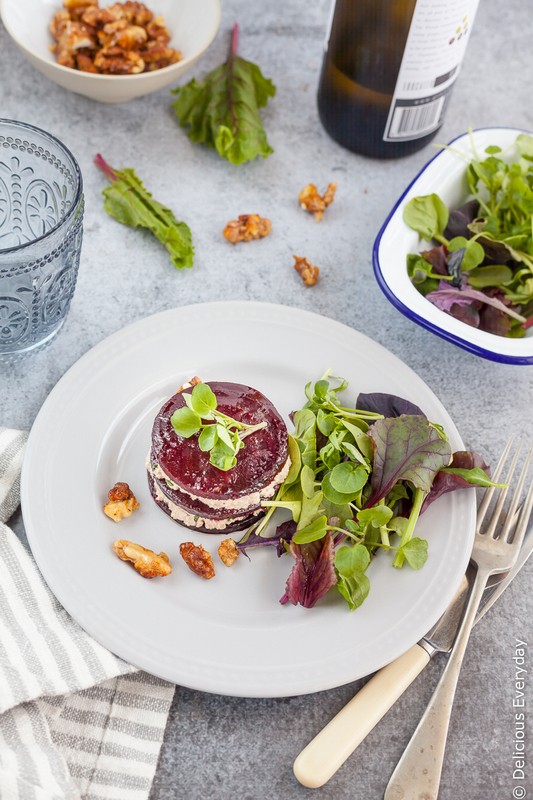 This roasted beetroot napoleon with walnut-chive cream is an elegant vegan appetizer packed with rich flavors. It looks fancy enough to impress your dinner guests, but they couldn’t be simpler to make! I’m all about easy, yet impressive recipes. And it doesn’t get easier than this gorgeous roasted beetroot napoleon. Beetroot can be a divisive vegetable. For many, there are horror-filled memories of tinned pickled beetroot that tasted more of sweetened vinegar than anything else. I remember that wicked concoction being served alongside Thanksgiving dinner, and grew up thinking that was the only way beets could be eaten. But roasted beetroot is actually a beautiful (and delicious) thing, and has become one of my favorite go-to ingredients for vegan meals. It’s earthy, yet subtly sweet. Kind of like the consistency of a roasted potato, but less crispy. Careful pairing can balance the deeply earthy characteristic that some people find a little overwhelming. 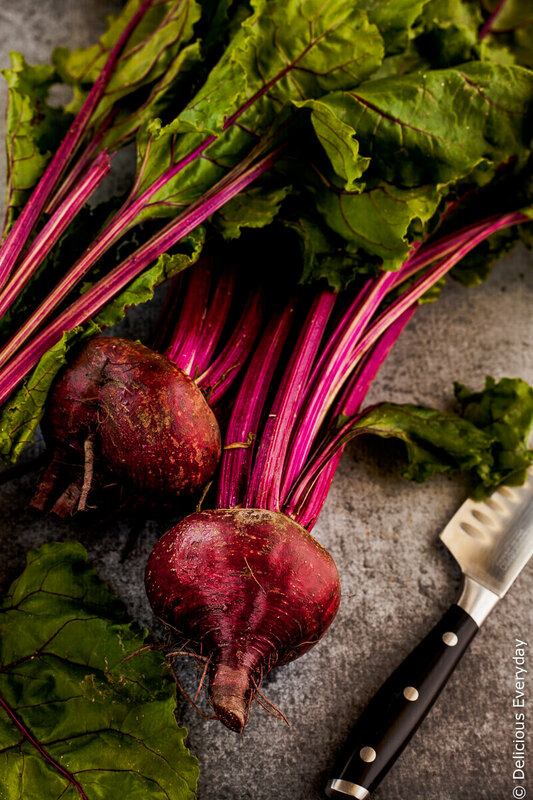 Check out some of my other favorite beet recipes also, like Roasted Beet Salad or Beetroot and Goat Cheese Tart! Let’s make a Roasted Beetroot Napoleon! I often get asked how to cook beets. I admit that they can look a bit intimidating at first, but it’s actually really simple. I almost always roast my beets, as I think it’s the simplest way to prepare them and is the best way to bring out their sweetness. To roast beets, just coat them in olive oil and wrap them in baking paper. You can also use aluminum foil if you have it handy, but I’ve found they come out best with the baking/parchment paper. Roast them in the oven for 30-40 minutes, and that’s it. When they cool, it’s super easy to peel the skins off the cooked beets. 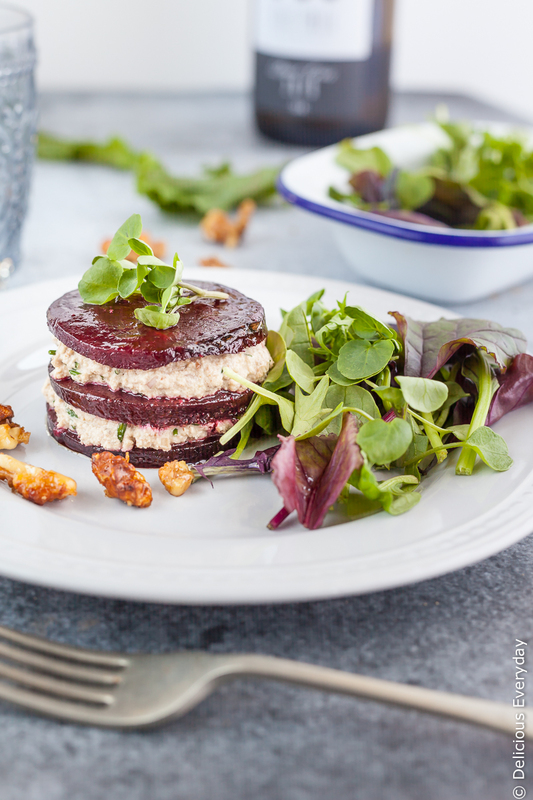 My beetroot napoleons are filled with a dairy-free walnut cream, spiked with chives and a little apple cider vinegar to contrast the sweet earthiness. Bitter salad greens and maple roasted walnuts add the final finishing touch for an explosion of flavors. The walnuts, for the walnut chive cream, are soaked for a few hours, or overnight, and blitzed until smooth in a food processor. Use good quality walnuts for the freshest flavor. I like to use these Kirkland walnuts – they are always fresh and are a great value. A good food processor will also make this so much easier and faster to prepare. I am a huge fan of my Oster 3-in-1. It’s really convenient to have a blender and food processor all in one device, so it takes up way less space in my cluttered kitchen. And it makes quick work of anything I toss into it. If you want to be extra fancy, you can use a round cookie cutter to cut all your beetroot slices into the same size and shape. But it will taste just as good if you skip this step! Subscribe to the Delicious Everyday weekly newsletter. It’s FREE! As a subscriber bonus, I’ll also send you my complete pantry guide for delicious vegetarian meals. 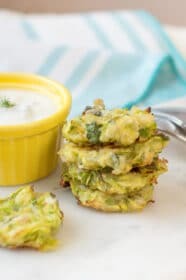 A wonderfully impressive and deceptively easy elegant vegan appetizer. Trim the beetroot and wrap each beetroot in baking paper or foil to roast. I prefer to use baking paper as I find it cooks quicker, but if you have foil, by all means use that. Before encasing, each beetroot add a splash of olive oil. Roast 180 celsius (350 Fahrenheit) for 40 minutes or until tender. When the beetroot is cool peel and slice about 1/2 cm or 1/4 inch thick. Add the balsamic, olive oil, sugar and salt to a bowl. Whisk to combine and add the beetroot and toss to coat. At this point, you can leave the beetroot overnight to marinate in the fridge. To make the maple walnuts, preheat the oven to 180 celsius (350 fahrenheit) and toss the walnuts in the maple syrup and salt. Scatter in a single layer on a baking tray and bake for 15 minutes. To make the walnut cream drain the walnuts well and add to a food processor. Add the water, apple cider vinegar, nutritional yeast, miso and oil. Process until a smooth paste. Remove the walnut cream from the food processor bowl and add the onion and chives and season to taste. Shake the marinade off the beetroot. If you want to go that extra mile and impress your guests use a cookie cutter and trim each slice of beetroot to the same size. Place a slice on 4 serving plates. Top with a dollop of the walnut cream, spreading it to the edge of the beetroot. Top with another layer of beetroot and repeat until you have 4 slices of beetroot and 3 layers of the cream. 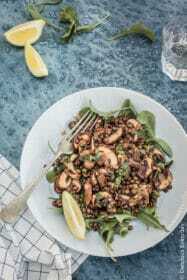 Serve with salad leaves, a scattering of the maple walnuts and a few drops of the beetroot marinade scattered over the plate. 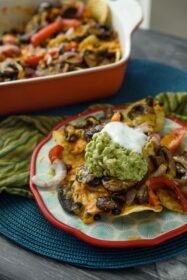 Subscribe for more vegetarian recipes from Delicious Everyday. It looks really good. I LOVE roasted beets and make them often. But I don’t bother putting any oil on them and they turn out perfectly delicious and sweet. 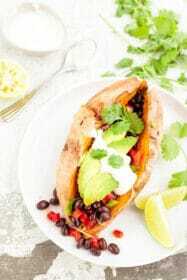 This recipe is really high iin fat, so I will make it but adapt it for my own needs of eating very low fat. Thanks for sharing. Good idea – beets are delicious on their own as well! It’s looking very yummy and colourful, thanks for sharing this delicious recipe. OMG! I love beets! I have got to try to this. Fresh beets are to die for. Wow! This sounds delish and looks even prettier! I recently fell in love with beetroot juice, and i guess it’s time to fall in love with roasted beetroot napoleon. What a pretty color for Summer! What a perfect combo. I bet the textures and flavors go together beautifully. OMG, I have become obsessed with beets lately. This looks delish! This looks delicious! I never would have thought to use beets. I can’t wait to try this recipe, thank you! This is the perfect combo of flavors that I like to throw in a salad but you’ve nailed it for creativity and beauty! Pinned so I can make this! This recipe looks like something a Michelin star restaurant would serve, wow! And since I LOVE beets and walnuts, can’t wait to try this for our Christmas meal when I’ll have the family over and impress them with such a stunning vegan dish! 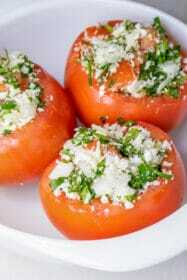 What a beautiful appetizer to make. I have never had many of the ingredients in your dish. I will have to check out the food processor as well. This is a beautiful and delicious looking dish! I’m in love with your Beetroot Napoleons! Seriously, though, you are so creative with your flavor combinations, and this one is screaming my name. I adore beets as an adult, but as you mentioned, as a child I had them out of the can. My mom was a wonderful cook, and most veggies were fresh, but we had beets and spinach from a can. Yuck! LOL. I grew up with beetroot from the can as well. Ick! Fresh is so much better.